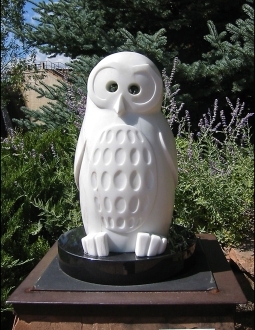 A sparkling white marble owl caught the community’s eye and took home The Arts Advocacy Projects first-ever Peoples’ Choice award following an online poll. The competition asked community members to vote on their favorite sculpture displayed in the art-on-loan program, which decorates downtown Loveland with sculptures made by local artists. Woodbury will receive a $500 prize from the Loveland Visual Arts Commission, which sponsors The Arts Advocacy Project and Peoples’ Choice competition. This is the first year the commission hosted the Peoples’ Choice event, which members decided to incorporate as a way to introduce community members to the temporary downtown art and to share their opinions. With more than 200 votes this year, coordinators said they are happy the competition got off to a good start. “The public participation in the Peoples’ Choice poll was terrific for the first year in place,” said Suzanne Janssen, Loveland’s public art/business services manager. This years art-on-loan selections will remain on Fourth Street until May, when a new batch of sculptures will be brought in to replace them. The commission still is accepting applications from Colorado artists who would like their work displayed in downtown Loveland. Artists can submit their work at www.callforentry.org.